Bonakele Pemba, or Bobo as he is affectionately known, grew up in the townships of Port Elizabeth. He began his tertiary education at the University of Makerere, Uganda, where he studied Environmental Studies and Practical Skills. 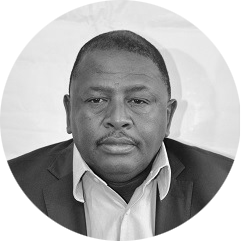 A veteran of the liberation struggles and former MK combatant, Bobo also worked at an ANC Mission in Uganda where, in addition to sourcing funds, his primary role was to find schools where students in the area could receive a satisfactory education. His exceeding competence and dedication to this role impressed the ANC and, in early 1993, they invested in him by sending him to the Centre for Foreign Relations in Das Es Salaam, Tanzania, to study Diplomacy and International Relations. During this time Bobo was exiled and sent to Moscow by the ANC to study Marxist Leninist Political Science. Upon his return to South Africa in 1995, Bobo took on the post of Coordinator at the Umzamo Community Development Trust in Port Elizabeth. Succeeding this he was employed as Marketing Director of Pensecure Pty Ltd, at the time a subsidiary of the Post Office; Pensecure later dissolved and he joined the Post Office as their Eastern Cape Retail Manager. Concurrent to his employ at the Post Office, Bobo also studied a Management Development Programme (MDP) and a Senior Management Programme (SMP) at the University of Pretoria’s Graduate School of Business. In the late 90’s he decided to focus on his entrepreneurial career and began to acquire shares in various companies, these include ABSA, KWV and Sasol. It was during this time that he met Siva Govender and Puven Ramasamy and his association with Amava began. Amava was in the initiation phase of setting up their Mining Portfolios and Bobo, due to his background in Diplomacy and his wider network, was the ideal candidate to assist with this venture. He has played a vital role in finding strategic opportunities within the major mining companies and his ability to liaise directly with top-level executives and get fast, impactful results has assisted with business introductions to these mining majors. His dedication to Amava is unwavering and in the next five years he aims for Amava to be a listed major global player, and the first truly black mining company which was built from the ground up by black entrepreneurs. Bobo’s achievements include setting up the Annual Eastern Cape Awards where people were recognised for their positive contribution to society. He is the founder of the George Pemba Art Foundation, in honour of his late grandfather, an initiative which embraces the arts in general but also seeks to encourage, and tap into, the potential young and aspiring South African artists who wish to enter the world of Fine Art. Bobo also sits on the board of the Chamber of Mines on behalf of Amava Mining. Bobo is currently busy with an International Jazz Festival in the Nelson Mandela Bay Municipality.